All eyes were on the Commonwealth Games, ASICS Greater Manchester Marathon and some of the big European road races at the weekend, but other events of note included the following. 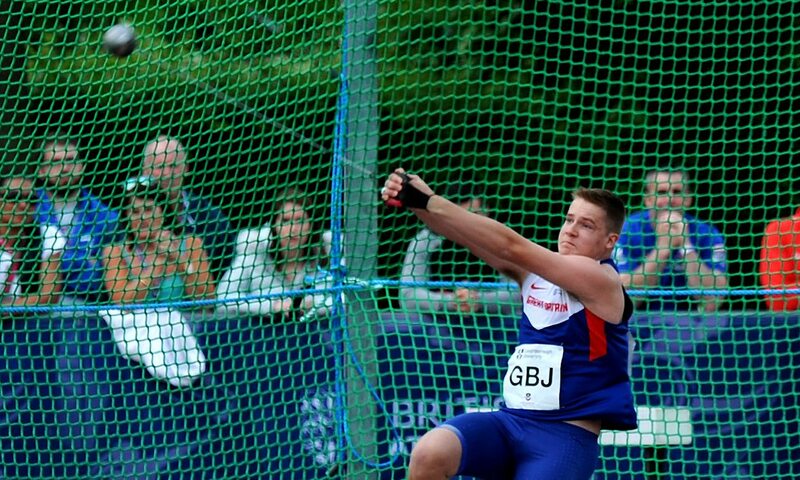 In a good weekend for British hammer throwing, Jake Norris continued his good form in the USA as he smashed the British record with the junior implement with 79.55m. It is three metres further than any other world junior has achieved this year and Norris also won the senior hammer with 70.04m. World indoor 400m record-holder Michael Norman won the 200m in a 20.06 PB into a headwind. Quincy Hall won the 400m in a world-leading 44.60 ahead of Paul Dedewo’s 44.62. Britain’s CJ Ujah won the 100m in 10.15 and was fourth in the 200m. World record-holder Aries Merritt won the 110m hurdles in 13.47, while hammer world leader Maggie Ewen showed her versatility with a 19.22m shot and 61.27m discus. There was a decathlon world lead and PB for Estonian Maicel Uibo with 8407 points with Briton Tim Duckworth improving his PB to a world-class 8145 points. His marks included an 8.03m long jump. There was a Bahamian 200m record of 19.75 by 400m world medallist Steven Gardiner, who is also due to race this event at the Commonwealth Games. World champion Pawel Fajdek threw 79.43m in the hammer for a brief world lead before Nick Miller’s Commonwealth winning throw replaced him. South of England cross-country champion John Gilbert continued his fine form with a 65:18 PB victory which gave him a near three-minute victory over Jonathan Cornish’s 68:16. Tonbridge dominated the women’s race with Lucy Reid’s 76:19 winning from Nicole Taylor’s 77:18 – both times were PBs. In third their team-mate Maria Heslop followed up her recent Hastings Half-marathon win with 79:23 to break her seven-year-old PB and go No.2 all-time among over-50 athletes. UK masters marathon record-holder Steven Way won in 70:32, while Katie Synge won the women’s race in 82:25. Ryan Prout won the 10km in 32:06 ahead of James Connor’s 32:16 as Liz Davies was first woman in 35:56. William Mycroft won the men’s race in 71:12 while Nicola Squires won the women’s race in 79:21, not far ahead of Kirsty Longley’s 79:36. Sam Hancox led a clean-sweep for Morpeth Harriers winning in 31:53, with Tracy Millmore repeating her 2017 victory in the women’s event in her final outing before the London Marathon, winning in 36:31. John Eves won the men’s race in 53:24. Georgia Schwiening won the women’s race in a course record 60:11, bettering Danielle Sanderson’s 2004 course record. Ethiopian runners dominated with Buze Diriba winning the women’s race in 53:45 and 21-year-old Jemal Yimer was first man in 46:17 in his first visit to the USA. Joan Melly Chelimo won the women’s race in 65:04, the fifth fastest in history, missing the world record by just 13 seconds after being well inside target pace for most of it, passing 5km in 14:51 (62:40 pace) and 10km in 30:14. Caroline Kipkirui, was second in 66:09 with Ethiopia’s Worknesh Degefa third in 68:09. Benard Kimeli won a much closer men’s race race in 59:47 with Geoffrey Yegon (59:56) and Peter Kwamai (59:58) ensuring a Kenyan 1-2-3.